The Crow's Nest01263 715779work01603 870304fax Self-cateringA contemporary, light filled, airy first floor apartment in the ever popular Broads village of Horning. This lovely spot, made just for two, enjoys great views from every window of the village and the pretty River Bure that runs through it. The Crow's Nest offers weekly bookings starting on Friday. 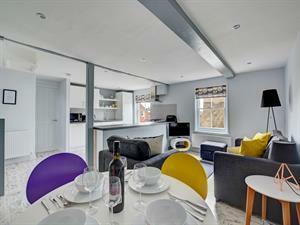 A contemporary, light filled, airy first floor apartment in the ever popular Broads village of Horning. This lovely spot, made just for two, enjoys great views from every window of the village and the pretty River Bure that runs through it.